AMONG THE LOWCOUNTRY-S majestic oak trees, just west of the Ashley River, life uncomplicated begins at The Arboretum. The 246 luxury condos overlook a lagoon, a water garden and lush vegetation. Prices begin in the $140s and cap near the $220s, while homeowner association fees are between $133 and $224 per month. 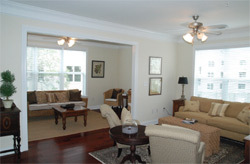 The one- to two-bedroom homes range from 862 square feet to 1,446 square feet and are located off Glenn McConnell Boulevard and the Mark Clark Expressway, practically across the street from Bon Secours St. Francis Hospital and convenient to the airport, downtown, the Medical University of South Carolina and the College of Charleston. The Arboretum is truly the best value in Charleston. Its quality construction and luxurious lifestyle are unmatched in this price range. The Arboretum condominiums offer garage parking, storage units, elevators and secure entrances to each building. Kitchens are equipped with a dishwasher, a microwave, a stove and maple cabinets. Condo owners will also enjoy the spaciousness of the homes, with all kitchens open to the living and dining areas. Custom options include maple and oak flooring, frisee carpet, crown molding, stainless steel GE Profile appliances and granite countertops. The 5,000-square-foot resort-style clubhouse is rich with amenities such as an inviting pool, fitness center, conference room, business center, kitchen and bar and an impressive great room complete with two flat-screen televisions and a massive fireplace. As if this wasn-t enough, the club-s spa offers massages, facials, manicures and more. Owners can throw a party in the club or wander out to the poolside screened porch and dine on barbecue hot off one of the many grills peppering the pool deck. There are six spacious floor plans from which to choose. The two-bedroom units start at 1,250 square feet from the $180s and top out at the 1,400-square-foot Carya, with a 19-foot-long sunroom that can serve as a great office, entertainment room or guest room. The one-bedroom designs start at 862 square feet and are priced from the $140s. At 1,179 square feet, including a study, the Cornus is the largest one-bedroom condo on the market and even eclipses some two-bedroom units. Interested in learning more? 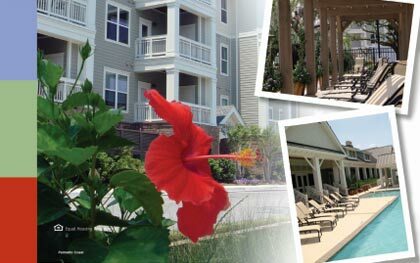 View each floor plan in detail by visiting www.LifeUncomplicated.com.